We have a few of these JP Rio Grande X RM Super Carmela 350 Calf's. We have had 2 Heifers and a bull out of this cross. RM Super Carmela is 78" TTT at 8 years old, and 80" TTT JP Rio Grande may be the greatest herd sire ever. These Rio girls are big and correct. She lost her 2017 heifer calf. 80" TTT RM Super Carmela 350 is one of the longest TTT cows out of Super Bowl, that produced well for us. 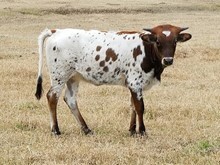 She was purchased by Stotts Hideaway Ranch at the 2011 Legacy sale.